'Glow revival' sounds exactly like what my skin needs right now so Shiseido was thinking ahead when naming this serum for their spring 2015 collection. 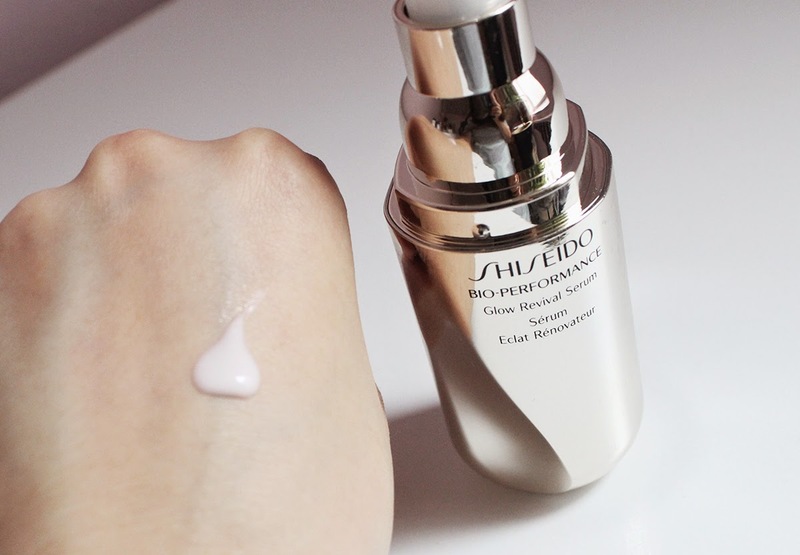 The newly released Shiseido Bio-Performance Glow Revival Serum* targets skin capillaries to even skin tone, boost radiance and improve resilience. I had high expectations for this product as the claims are quite lofty. "It dramatically reduces the appearance of redness, discoloration, dullness and signs of aging with a smooth, moisturizing texture that feels as if it's melting into your skin. With one month of use, the appearance of dark spots and pores are visibly reduced and your skin appears more resilient." Doesn't sound half bad, eh? I've been testing this serum for a little over a month and am finally ready to share my thoughts. The serum is packaged in an air-tight plastic pump bottle with a mirrored finish. The container looks quite pretty on top of my vanity and the reflective property goes well with the radiant concept. The bottle holds 1 ounce of product and will set you back $89. The pump is easy to control which is important since I find one full pump to be too much product. I usually do about half a pump for each application. As with the majority of Shiseido skincare, there is added fragrance in this product. However, unlike other products which I actually like the scent of, the Glow Revival Serum has a very strong perfume scent that I find overwhelming. It smells like I'm slathering perfume on my face when I use this. It's not a bad scent but it is very noticeable. Another ingredient I wish Shiseido would have left out of this formula is the shimmery mica. The serum is a very pale pink with lots of super fine shimmer. I just don't feel the shimmer is necessary if the serum can actually repair the skin like it claims. Due to the overwhelming scent and shimmer, I only wear this in the day time. I pump a small amount of this into my palm and mix it together with my face lotion. The sparkles aren't noticeable on my face but my complexion does appear more luminous. The texture of the serum is lightweight and smooth; it absorbs easily into my skin without feeling greasy. As for all the skincare benefits? I can't say I see a noticeable difference in my skin. Granted I do only use this once a day in combination with my moisturizer. But this particular serum just wasn't for me. I love the Shiseido White Lucent Serum and their Ultimune Concentrate which certainly make my skin look and feel healthier. But the Glow Revival Serum just didn't deliver the benefits I had hoped it would. Does it give you an instantaneous glow? Yes, but so can a less expensive highlighter. Perhaps if the fragrance was less potent and the shimmer was not included, I'd be more apt to use this day and night to better my results. Do you like your skincare to give you instant radiance or do you prefer slower but longer lasting effects? 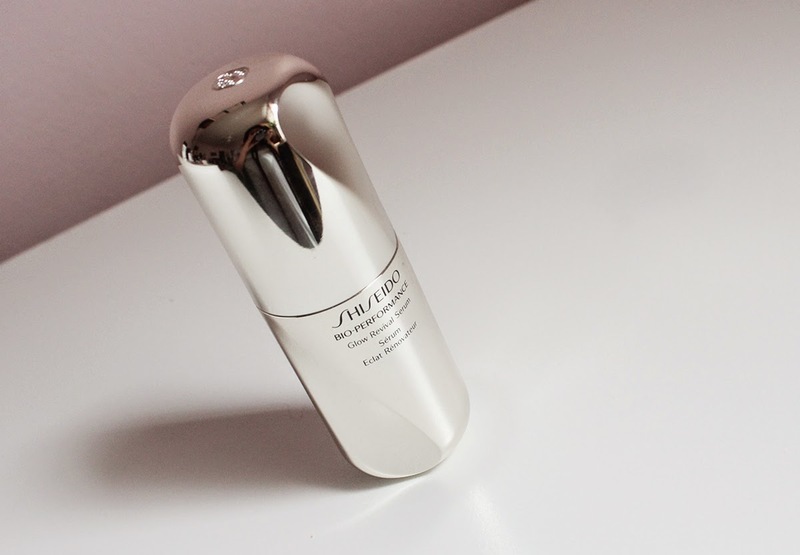 Have you tried any Shiseido serums? Let me know what your favorite glow reviving products are! *I was provided this product for free by PR and was not obligated to review it. All thoughts are my own and 100% honest.